In this section, you will learn how to create simple objects in GIMP. It's pretty easy once you figure out how to do it. GIMP provides a huge set of Tools and Shortcuts which most new users get lost in. Let's begin by painting a straight line. The easiest way to create a straight line is by using your favorite brush tool, the mouse and the keyboard. The dialog shows a new image, filled with a white background. Create a new image. Select your favorite brush tool or use the pencil, if in doubt. Select a foreground color, but be sure that the foreground and background colors are different. 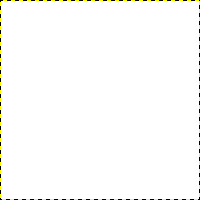 The dialog shows a new image, with the first dot which indicates the start of the straight line. 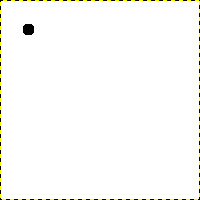 The dot has a black foreground color. Create a starting point by clicking on the image display area with the left mouse button. Your canvas should look similar to Figuur 7.35, “A new image”. The screenshot shows the helpline, which indicates how the finished line will look. Now, hold down the Shift button on your keyboard and move the mouse away from the starting point you created. You'll see a thin line indicating how the line will look. 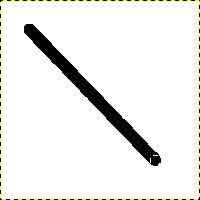 The line created appears in the image window after drawing the second point (or end point), while the Shift key is still pressed. If you're satisfied with the direction and length of the line, click the left mouse button again to finish the line. The GIMP displays a straight line now. If the line doesn't appear, check the foreground and background colors and be sure that you kept the Shift key pressed while painting. You can keep creating lines by continuing to hold the Shift key and creating additional end points.